I received a call recently from an Ad Specialty professional regarding the color of a client’s logo. The product being produced needed to match the client’s corporate identity and branding. The only information available was the CMYK (cyan-magenta-yellow-black) color formula which is the formula used for printed materials. The producer needed PMS® colors. 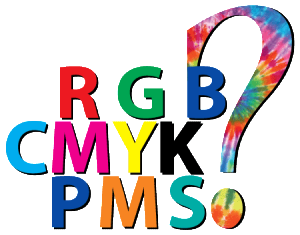 PMS® stands for Pantone Matching System and is a very precise print color formula. If the color must be exact, the PMS® color is the way to go. Just to add one more color formula into the mix, if you are developing a website or other online images, RGB (red-green-blue) is the formula to use. Well, after a bit of research and trial and error, I was able to provide two optional PMS® colors that were very close to the original CMYK formula provided and appropriate for this ad specialty item. So why is a logo style sheet important? When you have a logo designed or branding developed for your business, you want the color and fonts to be consistent from one medium to the next. When working with a graphic designer, be sure to ask for the style sheet. You personally may never use this or understand it or care. It’s not your industry. This is why you hire a graphic designer. They do care! It you just want the “bottom line”… the “takeaway,” skip down to the last paragraph! I know you’re busy. It’s okay! The color swatch for the red in this logo includes the PMS® number, the CMYK formula, the RGB formula and the Web Safe RGB number. In addition, a style sheet may display optional approved logo colors. Sometimes a 1-color logo is more appropriate and that information can be included. Some style sheets provide the guide for white space required around a logo. Other images and text must be a certain distance from the image. Finally, the style sheet will list approved fonts to be used. This information in particular can save an enormous amount of time (and money). There are so many fonts available, finding the correct one can be daunting. The bottom line is to be sure your graphic designer provides this information as part of a logo design project and your business brand development package. It will be invaluable as you continue to market your business.